In the darkness of the South African night, only our truck headlights and the stars illuminated our passage along the roads of Kruger National Park. Twenty expectant eyes and ears strained hoping to pick out some movement in the bushes around us. Knowing that its all about luck on a safari, and thinking perhaps ours had run out, we were just giving up hope when up ahead, right in the middle of the road, there they were. Two young males. They and us simultaneously caught off guard. There were gasps of excitement. This was quite rare to get so close, and we were about to get a lot closer. Confused and agitated under the spotlight of so many torches, these enormous adolescent creatures both started towards the vehicle. Our driver screeched ‘lights out!’ All lights were hastily extinguished and there was a sudden collective intake of breath. We were being charged. And at the exact moment when I braced myself for an impact, the bulls skidded to a stop barely centimetres from the truck, swaying and snorting so that their breath rolled over the bumper into the cold night air above us. Disoriented by the headlights, they hesitated, confused. And before we had time to realise just how much luck we did have, they turned. Every pair of eyes watched in transfixed silence as two enormously rotund bottoms waddled down the road away from us, horned noses sweeping the floor and tossing up to the sky until they were once again under cover of the South African night. The so called “Big Five” African mammals are lions, leopards, buffalo, elephants and rhinos. Reputedly these are the most dangerous of the big game to hunt. This accolade originates from the time when hunting big game was done with guns not cameras, but still their reputation proceeds them and with good reason. They are as powerful and dangerous as they are fascinating and beautiful. Having said this, sightings are not usually quite so frightening or quite so close. Some of these beasts are illusive and believe it or not, rather shy, and to see any of them is a privilege, not a right. In Kruger you are in their territory, not yours. Kruger is 7,523 square miles and big game will be wherever they want to be, which unfortunately might not be right next to the roadside posing for photographs. 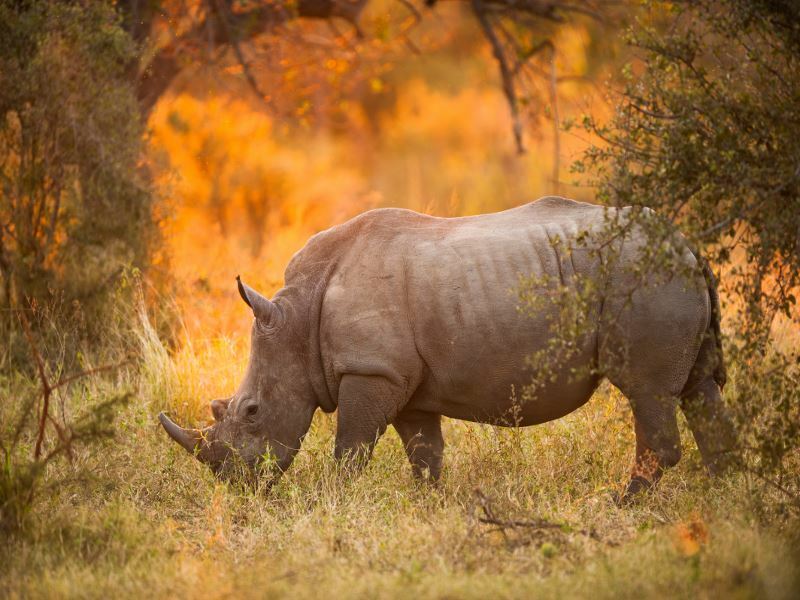 But if it is the Big Five you seek, then you couldn’t be in a much better place than South Africa’s greatest game reserve. In just three days I checked them all off my list. Notoriously hard to spot, the leopard is one of the most coveted sightings. A pair of red eyes reflected in the light of our torches on a night-time safari and we managed to capture one brief but glorious glimpse of this stunning feline before it vanished. Our guide told us “you might not see a leopard, but the chances are a leopard will be watching you”. There are many elephants in Kruger Park. My most memorable sighting was watching an entire family crossing the road right in front of the truck. As gentle as they appear, elephants can get a bit cantankerous. Apparently some have been known to sit on the odd vehicle if it finds it to be inconveniently parked! There are huge herds of buffalo in Kruger and we drove right through one and none of them batted more than an eyelid. They appear to me to be as docile as the cows at home in Wales, although I wouldn’t wish to put their apparent good nature, or those horns, to the test! Our driver waiting nearly fifteen minutes for one old bull to move out of the road. Clearly he wasn’t prepared to either! It took me a while to see exactly what the traffic jam of cars and 50-odd zoom lenses were focusing on. My first encounter with a lion wasn’t a close one, but still I will never forget it. It is very rare to see lions in action, they are quite lethargic a lot of the time. As was this one, who was seemingly oblivious to the commotion and grid-lock he had caused at the roadside.